My name is Aimee Benn, I’m 14 years old and I play snooker. I started playing when I was 12 thanks to The Paul Hunter Foundation that had a beginner’s course at the Menstone Club with WPBSA coach- David Horrix, in January of 2015. Later on that year, September, I competed in the women’s UK Championships at The Northern Snooker Centre, Leeds. I went into it knowing I wouldn’t win any matches but I came out with a win in one frame, which was a massive achievement- even entering the event at that stage was a massive thing, I had only been playing snooker 8 months and was only just 13 but the ladies there were brilliant and very friendly. In one match I had to play the 10 times Ladies World Champion, Reanne Evans and she was really nice afterwards. By this time I knew I was hooked and practice / receive coaching 3 times a week still at The Menstone. I’ve also entered many other competitions since, both local and ones a little further afield- at the Northern Snooker Centre in Leeds. 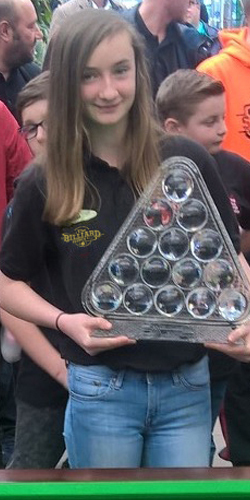 When the coaching had first been set up, we had a competition at the Menstone Club, the first one of many more to come and though it was a long day, I won the tournament and got a trophy for winning and for highest break of the tournament. I then went into entering in the women’s World Championships where my women’s world ranking went up from 63 to 52 out of 103, a jump of 11 places !! I recently have achieved my highest break so far, very recently of 24 with 3 reds and 3 blacks, my coach was so shocked/impressed, he fell on the floor ! My aspiration in snooker is to become women’s world champion one day and have the incredible opportunity to compete in the World Championships held in Sheffield at the famous crucible centre. It is also an aim of mine to achieve a century break or even a 147 !